Friday’s column is about this week’s meeting of the mixed-up Upland City Council. My colleague Ontario Now told me the May 26 “Saturday Night Live” had a soap opera sketch titled “The Californians” with a mention of Chino. The video is pretty funny regardless as it satirizes our love of driving directions and surface-street shortcuts. I get the feeling Google’s “translate” button has been employed on the original message a few times too many. Wednesday’s column plays off an LA Times Image section story headlined in print “A new essential?” about eyeglasses as “a stylish accessory” sometimes worn by people who have perfect eyesight. Whaaat? 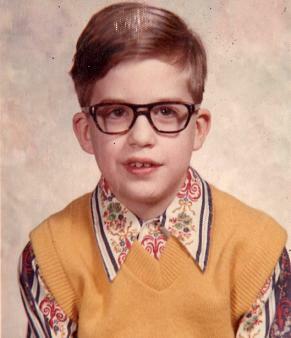 I write about beating the rush by having adopted the eyeglasses look in third grade. I think the accompanying picture of myself, the most horrifying photo I could find, dates to fourth grade. Love the shirt. If you wear glasses yourself, when did you begin wearing them? Feel free to share any eyeglasses-related stories or observations. The salad was served in a foam cup and consisted of shredded lettuce, seasoned ground beef, sliced olives, shredded cheese, a slice of tomato on top and a mayo-salsa dressing. It was adorned with a taco shell, broken in half lengthwise and stuck in the salad so that the shells looked like the horns of a bull. Hence the Matador Salad name. I wrote about the salad and said anyone who wanted a copy could email me. 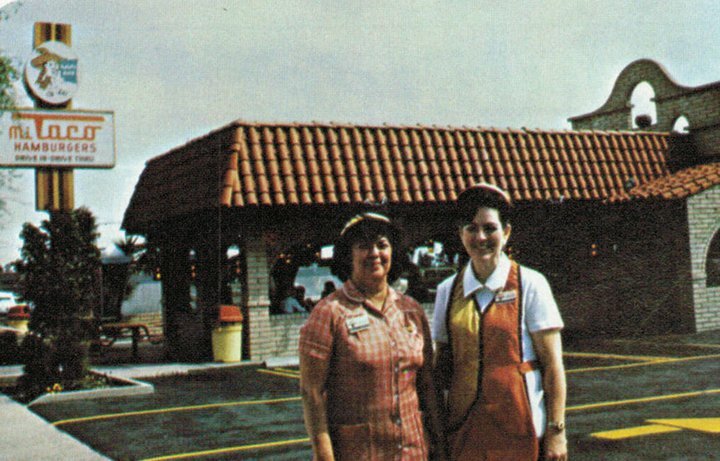 More than 200 people have done so, many recounting stories about their love of the restaurant. I wrote about that, too. Despite the intervening five years, people still email now and then requesting the recipe, and I always comply. For the sake of posterity, though, I’m now taking the step of simply posting the recipe here on my blog, where anyone can find it. I have yet to hear from anyone who’s made the salad, by the way. Layer salad in large bowl in the following order: lettuce, mayonnaise sauce, meat, salsa, cheese, tomatoes & olives. Place tortilla chips around edge of salad & serve. Sunday’s column compiles reader responses to a few recent columns, mostly the ones about my 25th anniversary in newspapers. 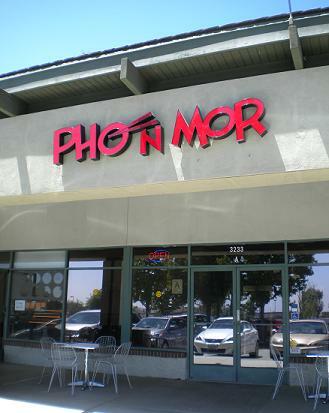 The Albertsons center in Chino Hills reflects the city’s growing Asian population: There are Japanese, Chinese and Korean restaurants and a foot massage business, and now there’s Pho N Mor, which has Vietnamese food and opened in late 2011. I haven’t done a comprehensive survey, but there may be only one other Vietnamese restaurant in Chino Hills. I had lunch at Pho N Mor recently with a friend. It’s decorated in modern style, making the most of a small space, and surrounded by windows on two sides, letting in plenty of natural light. Service was friendly and many tables were occupied. It was a hot day and I wasn’t in the mood for a bowl of pho, the popular Vietnamese soup, so I opted for broken rice with barbecued pork ($6.75, pictured), plus a mango smoothie ($3.25). My friend opted for pad Thai with chicken ($8). 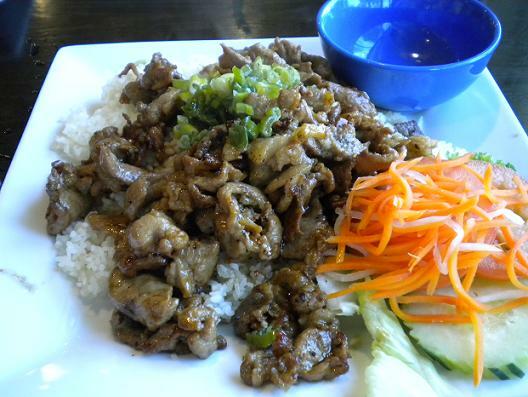 I liked my dish, but they used regular rice, not the variety known as broken rice. The mango smoothie was a mango freeze, made with crushed ice, not milk. The pad Thai looked good, but of course, that’s Thai, not Vietnamese. So, a mixed verdict: As a sort of entry-level Vietnamese experience, this was fine, but aficionados would probably want to head to Diamond Bar, Chino or Pomona. Two readers, Jaime and Don, separately told me a CiCi’s Pizza commercial was filmed in downtown Pomona, Don after observing the filming in January and Jaime after watching the finished product on TV weeks later. I’d never heard of CiCi’s Pizza and barely watch TV anyway, so this news didn’t do much for me. You can see the full commercial here, but all the Pomona stuff is in the embedded video above. So now I sort of know what CiCi’s Pizza is, but I still don’t think I’ve ever seen one. 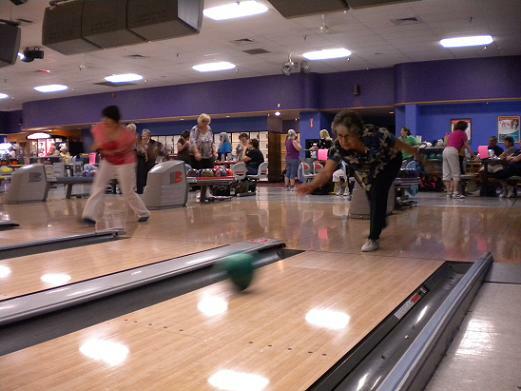 Wednesday’s column is about the St. Peter and St. Paul Ladies Bowling League, which ended its 40th season at a crossroads due to dwindling membership. Above is Lucy Herber. In a trivia note, this was the first time I ever managed to get a rolled bowling ball in a photo with my pokey point-and-shoot (which lags behind the action by a second). Thankfully Herber, 77, doesn’t bowl too quickly.